Cross-wrapped Silver: thin round 99.997% pure silver conductors cross-wrapped around a hollow thin wall Teflon® core - VERY close to purely resistive cable impedance (capacitance of the CWS cable is only 5pF per linear foot); optional source-terminated shielding (completely removed for he signal path). The RCA to RCA cable is terminated with genuine Swiss Neutrik Pro-Fi or Cardas GSMO RCA connectors. The connectors used with the balanced version of these cables are also sourced from Neutrik. 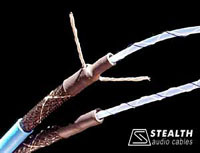 Stealth CWS cables has been compared to many very good commercially available cables (including silver) from major manufacturers, and many listeners prefer the “sound character” of this cable to other more expensive cables. However, it is known that different cables do sound different with different systems. Moreover, choosing cables is a matter a personal preferences and taste. In general, the more advanced and sophisticated equipment is used, the better result can be achieved when using this cable. You are welcome to listen to these cables for 30 days (enough time to break-in the cable and perform a critical listening) and compare CWS to ANY analog interconnects on the market retailed for under $1000, and if the sound is not for your liking – just return the undamaged cable for a full purchase price refund (minus the shipping cost). Please check the latest reviews and customers' feedback on the CWS interconnects.